According to Trooper Dumont (see note 2), he thought about taking Donohue in a cruiser to the hospital. Two things stopped him: According to Dumont, Tamerlan (nine bullets later and an undercarriage ride under a SUV) somehow still posed a threat on scene, whatever that means in regards to putting Donohue in a squad car, and “a suspect could emerge from the yard we were in.” Now before you get all carried away with that quote, Dumont, in his recollection of events, mentioned Jahar got away before he noticed Officer Donohue down. But it is interesting, nonetheless, because Dumont was the one who stated that earlier in the shootout he heard officers yelling the suspects were escaping through the backyards. Just something to note. Bottom line? They didn’t move Donohue into a cruiser and they did wait for paramedics. and Patrick Menton. The article described how the firefighters arrived on scene, the police put Donohue on a stretcher in the back of the ambulance and they took off for the hospital. 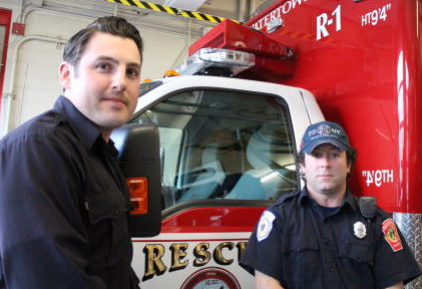 Watertown Officer Timothy Menton (not a misspelling, Patrick and Timothy are brothers) drove the ambulance while the two firefighters (EMT), Caruso and Menton, worked on Donohue in the back. The article is entitled, EMT James Caruso Saved Police Officer’s Life. Anyone notice how numerous people have been credited for saving Officer Donohue’s life? And that may very well be accurate and true because it was a team effort. But this article certainly doesn’t imply that. So who else saved Donohue before Caruso and Menton arrived on scene with the ambulance? According to Officer Donohue himself in a VMI alumni news interview, Donohue’s partner, Officer Luke Kitto was the first to help him. 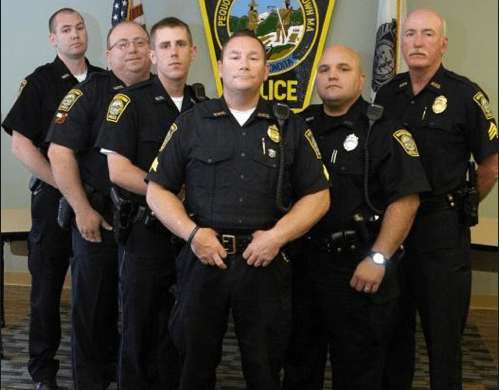 Officer Donohue stated that Kitto saw Donohue “stumbling and he tackled me to the ground…he started CPR.” It has been also been reported that Watertown Officer Menton, along with Trooper Dumont were also one of the first to help Donohue. Harvard honored two of their officers, Ryan Stanton and Michael Rea, for administering first aid to Donohue, “ultimately saving his life.” It has been reported that another Boston police officer, Ricky Moriarty, also came to Donohue’s aid. Officer Moriarty personally thanked those that helped Officer Donohue survive via bppa.org. So while sixteen people were working on Officer Donohue to save his life, what were the other officers on scene doing about Jahar’s getaway? Why was Jahar given a ten minute head start to elude the police? Boston Superintendent-in-chief, Daniel Linskey (the one who may or may not have torn Tamerlan’s clothes off, searching for bombs), admitted in an IEEE-HST.org interview that there were over a thousand officers in Watertown that night, prior to the perimeter being set. Yeah, over a thousand. And according to Trooper Dumont, he himself specifically directed Boston Police Gang Officers Scott Pulchansing and Sean McCarthy (who were already in their cruiser) to follow Jahar. And what about the other officers that we know were on scene but not helping Donohue such as Watertown officers, Jean Sarkissian and Michael Comick? Folks, this was a major shootout, an officer is down, explosives were used. They were not going after a 90 year old jaywalker. 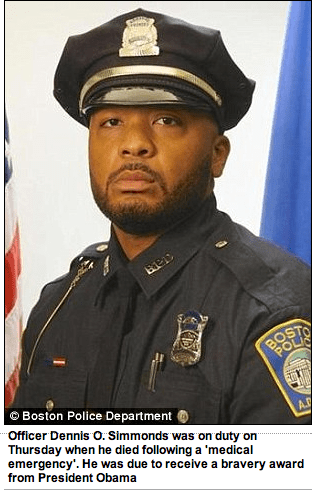 Asked by Bruce Gellerman from WBUR if he chased after the suspects, my favorite sergeant from Watertown, MacLellan stated, “I had to stay on scene, I had unexploded IEDs around my vehicle, I couldn’t even get in it.” Smh. God forbid these guys share a cruiser. 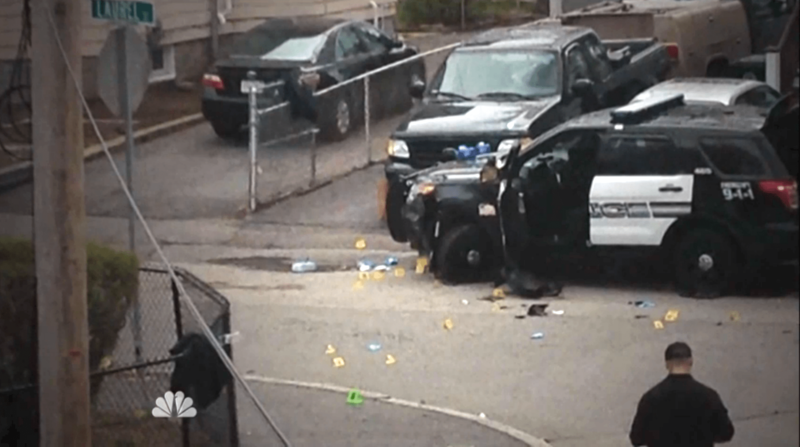 Bottom line – there were dozens upon dozens of officers at that scene that could have gone after Jahar. I’m not buying the story that all the police cruisers were blocked in. Surely not all of them were. Cleary, Pulchansing and McCarthy weren’t blocked in. So what happened? How did they lose Jahar? Trust me, cops will do almost anything to follow chase after a suspect who unloaded rounds and tossed explosives at them. Except, apparently, Watertown. Or Boston. Or MBTA. Or Cambridge. Yadda, yadda. The Watertown shootout begs the question of why no one, absolutely no one, followed Jahar in hot pursuit. Meanwhile WCVB.com wrote, according to an obtained police report, that Simmonds injured his hand, back and ankle (“and suffered blurriness in his vision”) the night of the shootout. Apparently, not a peep about a head injury in the police report. And then there’s the shot to the buttocks report which may or may not pertain to Officer Simmonds. Bottom line? We may never know. Of course the most interestingly thing in all of this is that it wasn’t until after Simmonds’ death we heard about injuries he sustained that night in Watertown. Prior to last Thursday? Zip, zilch, zero. Even Simmonds’ partner, Jean Jean-Louis, has never stated Simmonds was injured that night. If he has, no news outlet have chosen to run the story. Huh. Amazing. partner Jean Jean-Louis and Greg McCormack via PaxCenturian. Officer Moriarty wrote, “I’d like to thank Greg McCormack, Dennis Simmons [sic] and Jean Jean-Louis, who had the confidence and trust in me to reach out for my help after their involvement on Thursday night. I hope I was able to help.” Huh. What does that mean? No idea, but it seems strange. What was Simmonds reaching out about? Wasn’t he in a hospital somewhere? And Simmonds had the “confidence and trust to reach out” to Moriarty? Really…about what exactly? I was interested to know who exactly this third guy was that Moriarty mentioned in this cryptic message, Officer Greg McCormack. It’s possible I may be the only one who follows this case that didn’t realize TNT has a program called Boston’s Finest. Uh huh. And it has real Boston police on the show. And you guessed it, Greg McCormack is one of them. Some of the other officers on the show include Joseph Marrero and Richard Medina. You may remember those last two names from the 2006 case US v. Roberto Pulido. Don’t remember it? Let this jog your memory – three Boston police officers were convicted of protecting a drug shipment, trafficking steroids, holding after hours parties with prostitutes, identity theft and on and on. *Sigh* What can you say? Boys will be boys, am I right? As a result of that investigation, Joseph Marrero and Richard Medina were suspended for 30 days and 15 days, respectively, for steroid use. So kudos to them. They not only kept their jobs, they are now getting paid to be on national television. Not that any of this helps us with understanding Moriarty’s message to Officers Simmonds, Jean Jean-Louis and Gregory McCormack. So what happens now? Oh, the usual. Authorities are working on pinning Officer Simmonds death on Jahar, adding a few more counts to the list. What’s interesting to note is that the lack of Simmonds’ autopsy will make it more difficult to pin Simmonds’ death on Jahar – apparently Simmonds’ family declined an autopsy. They declined the autopsy, huh? That’s odd. Or maybe convenient for authorities. The third accidental shooting that took place that night involved a black police SUV and gunfire. According to bostonglobe.com, “a state trooper fired at an unmarked Boston police SUV, en route to the scene” and the article went on to say that “no one was hurt.” The officers in that SUV? Boston Police Officer Kenny Conley and State Police Officer Dan Walsh (see! they do share rides). So who are these guys? Google Officer Kenny Conley. He was federally prosecuted years ago for a shooting but his conviction was eventually overturned. Or maybe it was for a beating? Who can keep track with these guys. It was a pretty big case and set in motion the study of “selective attention” in police officers on duty. Have you ever done that selective attention test where you watch a video and count how many times the people in the white shirts pass the basketball? I won’t ruin it for you and you can test your skill HERE. Admittedly I totally failed when I did it years ago. After doing the test read about how it ties in with Officer Conley’s federal case HERE. Correction: It was not State Police Officer Dan Walsh in the vehicle with Kenny Conley. His name is Daniel Wells. So there you have it. The events, according to police officers, that transpired that night in Watertown, starting with the events at MIT that led up to to it. I still haven’t heard if ballistics ever pinned Tamerlan’s gun on MIT Officer Collier’s death, I have no idea how officers at MIT made it to Laurel Street in time to engage in gunfire before it ended, I have no comprehension about the fact officers were not aware that the carjackers on Laurel had admitted to the bombings and Collier’s murder previously, I’m mildly amused at what a hot mess Sergeant MacLellan appears to be, Tamerlan clearly was some sort of android and Simmonds’ injuries and death are shady as &*$. Yup, that about covers it. Note 1: In the first The Police Story, I was not sure if Donohue showed up to the MIT scene with his partner, Officer Luke Kitto or not. 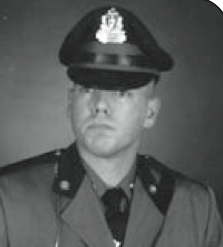 According to VMI alumni news, Donohue was working a “single-officer motor patrol, working the downtown area.” After he arrived at MIT, there he “linked up with another officer.” I am assuming that was Officer Kitto. Lt Jeremy Walsh, Cambrdge Fire Dept received medal of honor. He responded to bombing, was at Logan for Obama arrival, responded to Collier shooting (took over cpr) and was called to Watertown and aided Dohahue. He is a medic with special training.